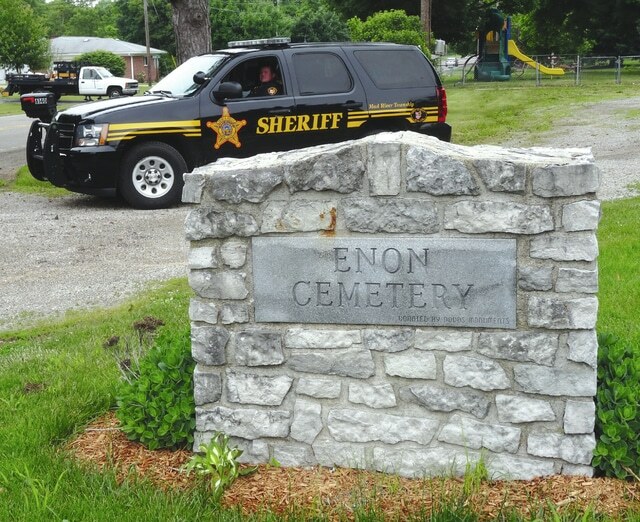 MAD RIVER TOWNSHIP — Security has been increased at Enon Cemetery following several reports of gravesite thefts in the last several weeks. During the Mad River Township meeting on Monday, Cemetery Sexton Don O’Connor told township trustees that a number of residents had reported recent thefts of potted flowers and plants which they had placed on the gravesites of love ones. O’Connor noted that this type of crime is on the rise in the county and especially occurs around the Memorial Day holiday. O’Connor said potted flowers and plants have been stolen from every section of the cemetery, and a number of the thefts have occurred during daylight hours. O’Connor stated that the gravesite of one village resident, who passed away in late April, had been robbed several times since her passing. According to O’Connor, her gravesite is in a section of the cemetery which is not secured by fencing and is located near Dayton-Springfield Road. “The lady’s husband placed potted plants on her grave one morning, and when he came back later in the day to water them, they were gone,” O’Connor said. Mad River Township Trustee President Joe Catanzaro suggested that township officials consider installing security cameras across the grounds of the cemetery. He pointed out that many surveillance cameras are now reasonably priced, and installing them in specific areas of the cemetery would also help deter vandalism. All trustees agreed to move forward with procuring several estimates of commercial-grade security systems that could be used for law enforcement purposes. “We would like to think that flowers placed out of love would be respected. This cemetery is many township residents’ final resting place, and there is more than a monetary loss when this type of theft happens. There is also an emotional impact on the family members of these departed people,” Catanzaro said. Thus far, local law enforcement has been unable to catch anyone taking flowers or plants from the cemetery. However, Mad River Township Sheriff’s Deputy Jeff Wise has increased daytime patrols and surveillance in the cemetery in an attempt to curtail further criminal activity. Wise said he would continue to work closely with township officials to address all criminal incidents when they occur. He is also asking anyone who observes any suspicious activity to contact the Clark County Sheriff’s Department. Residents are encouraged to label all items that are placed on gravesites and to report any thefts to township officials.